Deep in the Melovian Galaxy, Sam Alexander enters an alien starship to retrieve the helmet of a fallen Nova. As he claims the Nova helmet, Sam begins to see a holographic projection of a Nova being killed by Cadivan. Suddenly, Nova turns to find himself facing the ship's captain but he's not a hologram this time! Cadivan psycho-magnetizes his weapon and uses it to take Sam's helmet from him. Surprisingly, he gives it back to Sam Alexander claiming that the young hero is neither a challenge nor a paid target. The alien hunter teleports Sam off his ship into space. After Cadivan's ship jumps into warp, Nova decides he will use the dead Nova's helmet which is still on the ship to track the hunter later. The teenager orders his helmet to stop finding dead Novas for awhile. In response, the helmet reveals a distress signal coming from a living Nova! Back in Carefree, Arizona, Eva Alexander has found a new job as a waitress. She assures Mr. Taylor that she won't be bringing her daughter to the diner during work. Eva is counting on Sam being able to help take care of his sister. Meanwhile in space, Sam has located a giant starship belonging to the Nova Corps! The ship is being held in place by tractor beams from two other ships. Sam assumes they are pirates salvaging the starship. Nova begins attacking the two ships and quickly disables the first ship. The crew launches an EMP torpedo at Sam who deflects it back into the ship and depowers it. The young hero moves onto the second ship and becomes a human missile through it! 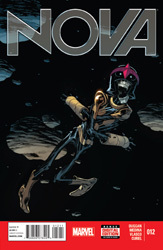 After pushing the Nova Corps starship to safety light years away, Nova goes on board and meets Captain Skaarn. The captain reveals that he had salvaged the starship as a derelict and its automated distress signal must have alerted Sam. Skaarn takes Nova to the ship's modified power station to show him the problem they are having with the ship. Nova is repulsed to find a dead Nova Centurion wired to the ship as a power source! The ship's engineer explains that the Centurion had died due to a microscopic attack. They have been electrically stimulating the dead body and harnessing the energy output through the helmet. However, as he has decayed, the power levels are dropping drastically. They ask Sam to take the Centurion's place and charge the batteries. Nova refuses. In order to help change his mind, Skaarn introduces Sam to a member of his crew named Jinin. Nova asks why he can't get a reading from the Centurion's helmet on how he died. Skaarn responds that the helmet may have been damaged when they drilled into it or perhaps it was due to the microscopic infection. The teenager decides to help them and begins generating power. The engineer is shocked at the amount of power coming from Nova. Within seconds, the ship is fully powered! Skaarn and his crew thank him and open the airlock for Nova to go. After Sam leaves, the captain orders the automated distress signal disabled as he doesn't want any more unannounced visitors. Later in Carefree, Sam arrives home in time for breakfast with his family. Sam Alexander is happier than he has ever been. Back on Skaarn's ship, Jinin is upset that she hasn't been given the real food she was promised for helping the captain. Skaarn threatens to give her food to the others on the ship. She quickly eats the stew she has before she is thrown back into the prison area with the other aliens. Skaarn tells them they are going to be sold on the slave market. Elsewhere, the captain of one of the ships Sam believed were pirate ships reports to his leader that their mission to rescue their missing citizens has failed. Skaarn is revealed to be the pirate and a kidnapper. The leader steps forward and Beta Ray Bill claims that he will bring the corrupt Black Nova from Earth to justice!